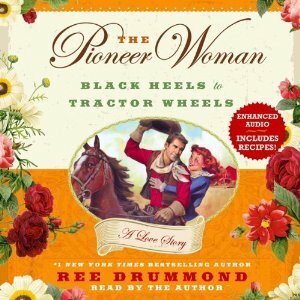 Before she was known as The Pioneer Woman, Ree Drummond was a city girl through and through. When Ree decided to uproot her life in L.A. due to a dead-end relationship, her plan was to spend some time back home in Oklahoma before uprooting her life again and moving to Chicago. Chicago was the perfect place to start a new life: it had all the draws and conveniences of big-city but was just one plane ride away from her family back home. But then one night while out with some friends at a bar in her hometown, she met a cowboy whom we only know as Marlboro Man. Ree found herself falling head over heels in love with Marlboro Man and her plans for a new life in the hustle and bustle of Chicago were soon replaced with preparations for life on a cattle ranch in the middle of nowhere. This was not the life she had planned for herself, but as Ree displays with great insistence throughout the course of the book: the heart wants what it wants. If ever there was a feel-good love story, Ree Drummond has it. I love watching her show on Food Network every weekend and I equally love watching her family interact. Ree proves in this heartwarming memoir about the man who swept her off her feet that she's no slouch as a writer. As someone who tends to shy away from cheesy romance novels, Ree manages show me that cheesy romance memoirs are worth my time, most likely because she doesn't take herself too seriously. Her sassy, self-deprecating humor is a perfect antidote to all that is cliche in the world of romance writing. After listening to Ree narrate her own story in this audiobook, I have to say that my admiration for her continues to grow. As someone who was used to the conveniences of a suburban existence, Ree displayed virtually no resentment toward her new husband when she moved to his ranch in the middle of nowhere. She made the best of her situation and realized her happiness was with her husband, not in her surroundings. I wish I had been able to be so adaptable in my own love story. I hope despite Ree's busy schedule with her new show that she doesn't stop pursing other book ideas. Listening to this memoir made me hope for more than just cookbooks to be authored by her in the future.